I have to confess.. 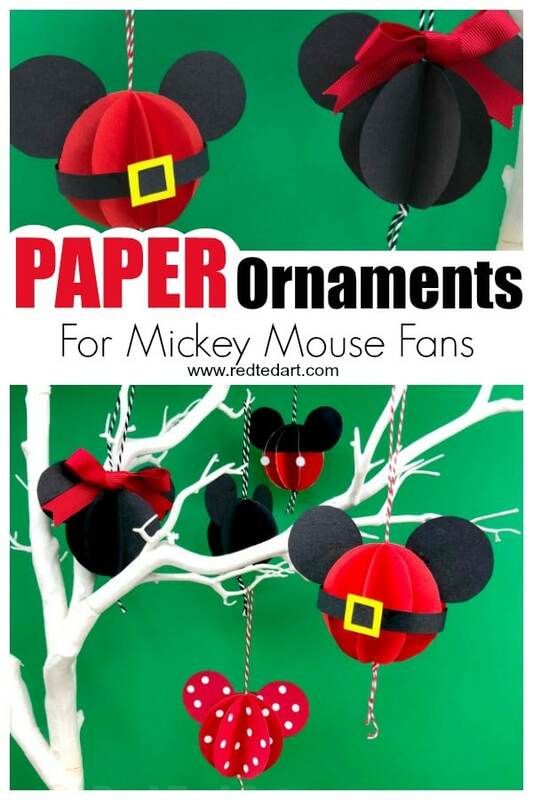 I have no idea why I didn’t think of these easy peasy Paper Mickey Mouse Ornaments YEARS ago. 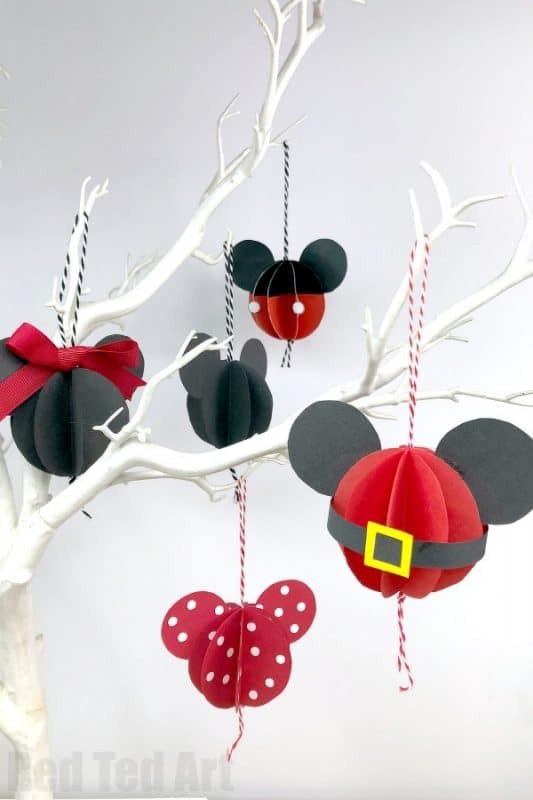 I am just totally head over heals with these DIY Mickey Mouse Baubles. They are so cute. 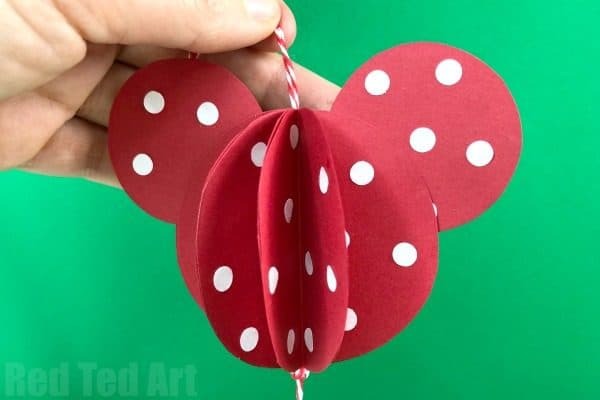 And there is a Minnie Mouse Ornament (two in fact) and a Santa Mickey Mouse Bauble and of course a “simple” DIY Paper Mickey Mouse Ornament too. Once craft.. 4 ways to make. 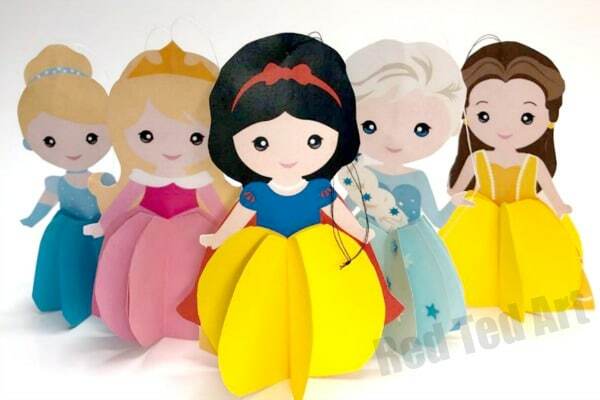 Each as cute as the next.. and a total must for all Mickey Mouse fans!!!! Hooray. 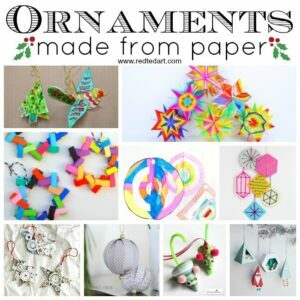 These join the growing list of fantastic Paper Christmas Ornaments for you to check out, as well as our complete list of Handmade Christams Ornaments. Each year it grows and grows! 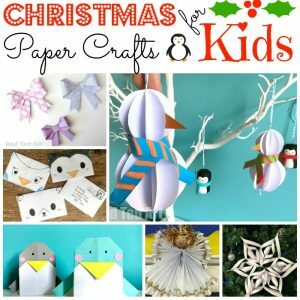 We love paper Christmas crafts for Kids! 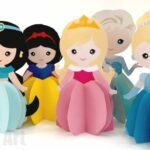 Especially when they come with a free printable! Love Mickey..? Want more inspiration? 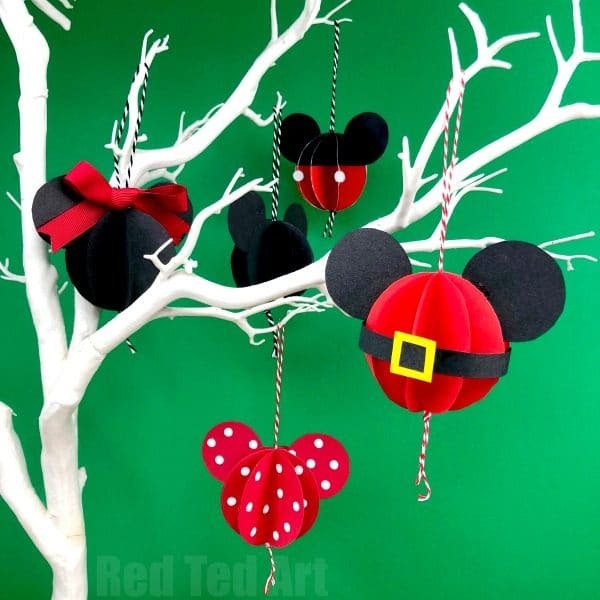 Try these beaded Mickey Ornaments. Just gorgeous! 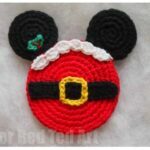 Learn how to make the Mickey Mouse Ornaments with our step by step video tutorial or check out the photo steps below! 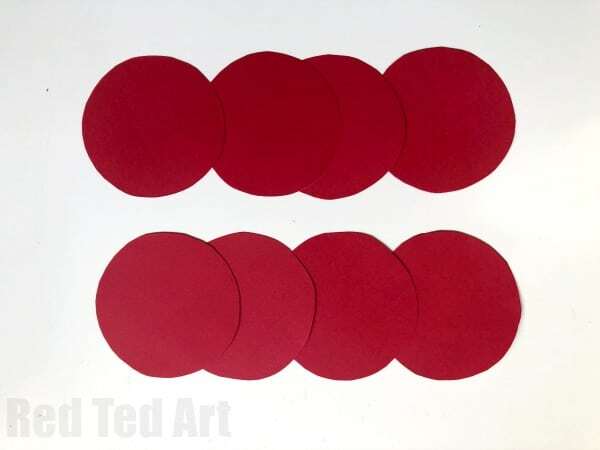 Cut out 8 circlular shapes approximately 6cm in diameter in the desired colour (red, black or printable). 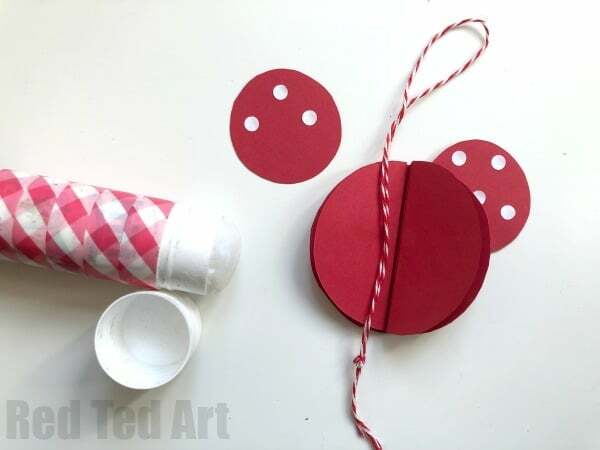 Use our free printable or s small cup to trace. 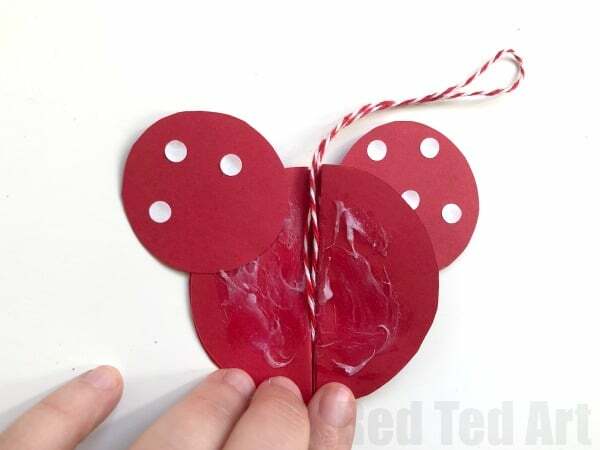 If making Mini Mouse – make some white cirlces using a hole punch and stick on to your red cirlces. 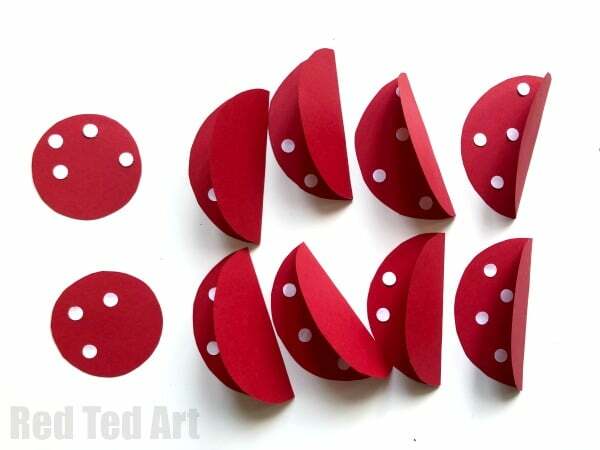 Fold all your 6cm circles in half (not the two smaller ones). 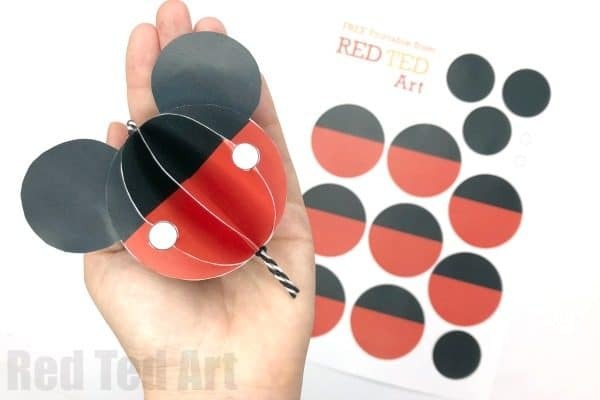 If using the mickey mouse printable, make sure the fold goes down the centre of the black and red circle – with either side mirroring each other. 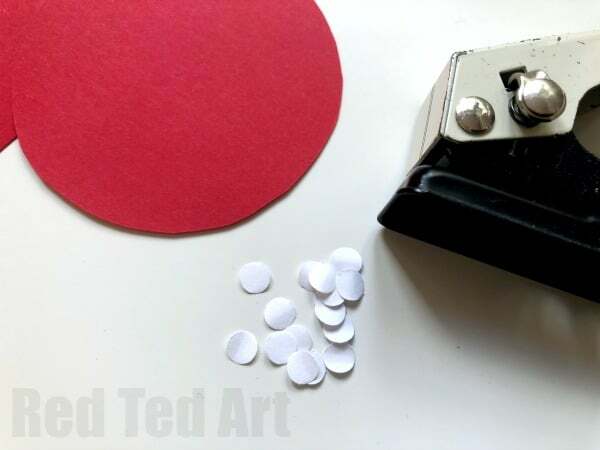 Add glue to the top of one half semi circle. Place a second on top. Repeat until you have stuck together the first 4 semi cirles. Position the smaller (4cm) circle on the top left – this will be your ear. 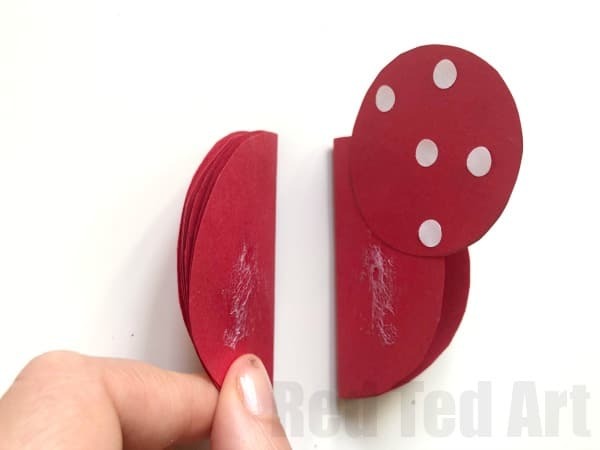 If using the printable, cut out two of the black circles and glue together so they are black on both sides. Now add the remaining 4 semi circles. Time to add the second ear. Tie a little bakers twine. 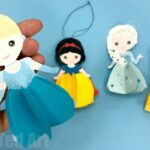 Add lots of glue to the spine of the cirlces as well as the remaining semi circle. Fold the circles open and bring together and stick. Make sure the bakers twine is nicely alined in the centre. 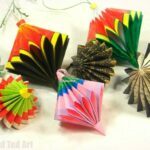 If making the black mini with a bow – now make a paper or fabric bow and stick against the bakers twine. 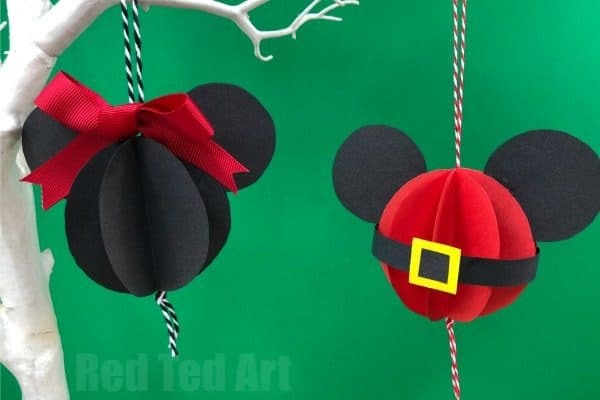 If making SANTA Mickey Mouse, cut a long strip of black paper that fits around the whole paper Mickey Ornament. Cut a small yellow sqaure and even smaller black square. 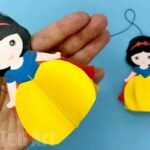 Glue these to the centre of the black paper to make the belt. 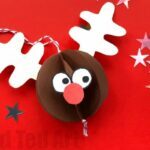 Give the front piece of your bauble a little fold and glue the centre of the belt onto that. Then create a small fold at the back and bring the rest of the belt round and glue in place. Finished. 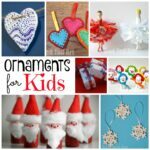 I this will happily keep the kids busy during the holiday break. thank you! what a lovely idea. Awww my pleasure! 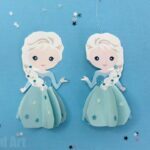 Enjoy making them!!!!! Which one should I make first?! I can’t decide and need to hurry up!! !